A1 Mobile Caravan Service COMES TO YOU! Dave has over 29 years experience repairing caravans and we pride ourselves on offering quality workmanship by an experienced tradesman. Having spent 10 years travelling around in a caravan, we have extensive experience with what actually works. Our solar systems are GUARANTEED to work in all conditions. In northern Australia, due to the heat, solar requirements are completely different to the rest of Australia. We are an authorised repairer for all insurance companies and most caravan manufacturers, including Jayco. 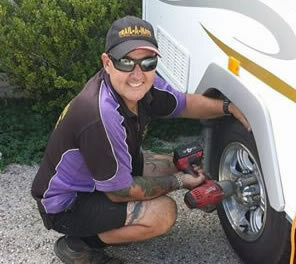 A1 Mobile Caravan Service recommends and uses products from  Dometic, Camec, Coast to Coast RV, ALKO, Thetford, SKF, Aussie Traveller, Carefree Awnings, Supercharge Battieries, REDARC.